I go away for a week on the Coast and what happens? …OH HI Cubicle jockey who is reading this over at NOSIC, brought hither by various keywords! How good do you feel about yourself, working for Marn’s Stasi Lite? I was once underemployed and desperate myself, but yeah but no. This is a disgrace. I was so angry I went out today and participated in a demonstration covert surveillance operation on Ferguson’s office with these excellent chaps. One of the spooks pictured above is the author of this opinion piece in today’s AGE. 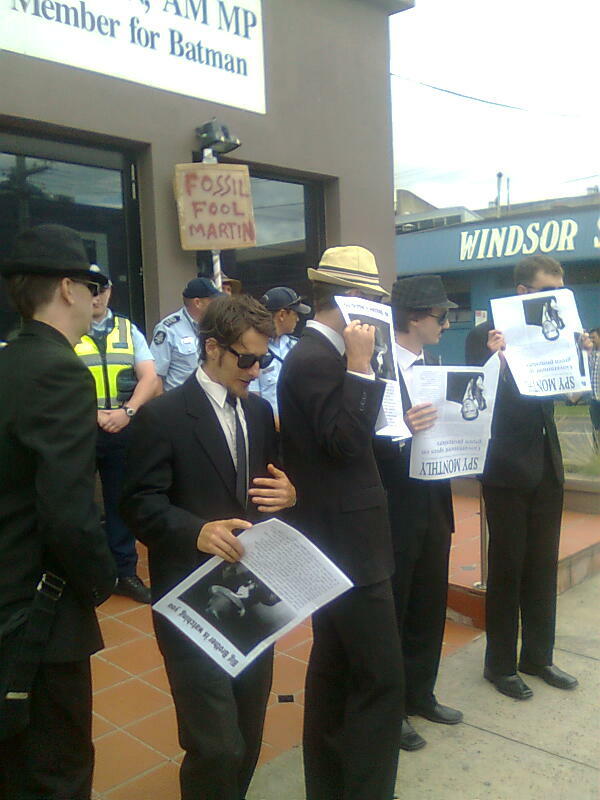 Anti-coal activists pose a political threat. That’s why we’re being spied on. I’d like to know how the government can justify employing a private company to spy on me. As an anti-coal activist, and member of one of three main community groups in Australia campaigning against the coal industry, I was alarmed by revelations in The Saturday Age that the Australian Federal Police has singled us out as a potential threat and is employing a private company to spy on us. The AFP were there before we were, natch, because the other spooks at NOSIC had read the Facebook group. Of course. This is your taxes at work: Pimply postgrads being paid to spy on your nephew’s facebook page; Police missing their lunch to stand outside Martin Ferguson’s mostly empty office protecting it against a piece of harmless theatre. It’d be hilarious if it wasn’t so bloody depressing. My vote is for depressing. I remember yonks ago [too many years] a very senior ALP politician of my aquaintance expressing incredulity and outrage when he discovered that he, and several of his colleagues, had been systematically spied upon by Special Branch and ASIO working in cahoots.